Hi OP. I wouldn't worry about camming the LQ4 yet if I was you, but would focus on getting the engine in first. Love the LS motors, and look forward to following your project. Hope you can get the motor to fit while retaining the steering box and linkages. From my experience with LS motors, the shortest accessory system is from a Corvette, while the lowest / cheapest intake is from Camaros should you have any space issues. Hotrodders are also now using Delco Remy R4 A/C pancake compressors mounted in front of the passenger side head of to solve chassis rail clearance issues. I don't remember exactly now, but I think GTOs came with a front sump oil pan. The accessories / setup you need may be very similar to what's needed to put that motor in a Nissan 240SX, so do some research on that combo for some ideas and off the shelf adapters. What axle ratio does your car have now? Thanks for following my build and commenting. The W114 chassis actually held a MB 6.3 ltr overhead cam V-8. Getting a compact LS style engine installed can be done. But actual placement is going to be decided based on cost and front to back weight. The LQ4 engine with the 4L80 trans measures around 58 3/4" long from crank pulley to driveshaft face. This is about 4" longer than the engine and trans I just pulled out. The extra length is in the transmission. Since the driveshaft need to be modified anyway, shortening it is not really an extra cost. And having the engine as far back as possible is better for weight balancing. I think this also helps with getting my exhaust to fit between the firewall and the steering box. I have found a front sump pan with remote filter that I will need. The GTO pan still has a portion on the pan and the filter which could interfere with the steering rack. Although the LQ4 intake is hideous it still performs well, I'm going to try and keep it and the stock front assembly if I can. Quick measurements show that the LQ4 will be about 2" taller than the stock engine if I keep the crank centerline the same. I need to check hood clearance and how to shave a little off of the LQ4 intake. Now that everything is out I can measure a little more. Since I have one in my Jeep I can measure the real thing. The LQ4 front assembly is narrow and tall, the width works but the alternator is high and the possible conflict. GM performance sells the whole front assemblies for both the corvette style and the camaro style for about $900. Quick measurements show I have about 1" to spare with the LQ4 front drive with my radiator. Concerning the cam/springs/pushrods kit. One way or another this engine will be going in. I will be trying to fit the engine and welding in motor mounts and I estimate the engine will go in and out at least 4 times before finally bolting it in. As I expect to get stuck waiting for parts to proceed I will have the cam kit on hand to install during the down time. "In wine there is wisdom, in beer there is strength, in water there is bacteria." Is it possible to remove that upper radiator support? That would make your work ahead a lot (ok, maybe a little) simpler. I think one of those guys from downunder did so by drilling out the spot welds, and inserting "nutserts" after. I looked at taking it out and it looked like it would take some effort. I went ahead with pulling the engine/trans and didn't have an issue so I didn't mess with it. I felt like I had plenty of room so there shouldn't be an issue with the LQ4 and trans either. Today I pulled the rest of he items out of the engine bay. And I mean everything. 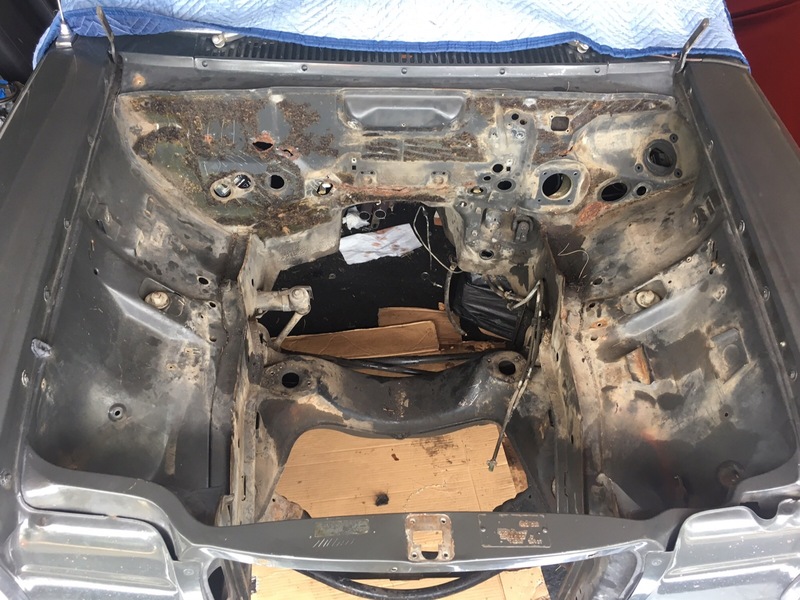 As I will be changing/upgrading the wiring, A/C-heat, gear selector, and possibly the brake booster and master cylinder there was no reason to keep anything intact. Since I don't want to pull the center console out yet I just used a saws all and cut the heater core connections flush. A little more rust than I originally thought. I believe the firewall insulation was trapping water. Going to take a few more patches. After stripping everything off it was time to start cleaning the years of rot, rust, debris, and grease. To keep from making a complete mess of the garage and driveway I put cardboard down and used engine cleaner sparingly. Went through a whole bunch of rags this way but it worked out. Used a wire brush in my angle grinder to clean off the balance oth firewall insulation and adhesive. Big mess. But after a couple hours and a good hosing I now have a clean new canvas to start building from. 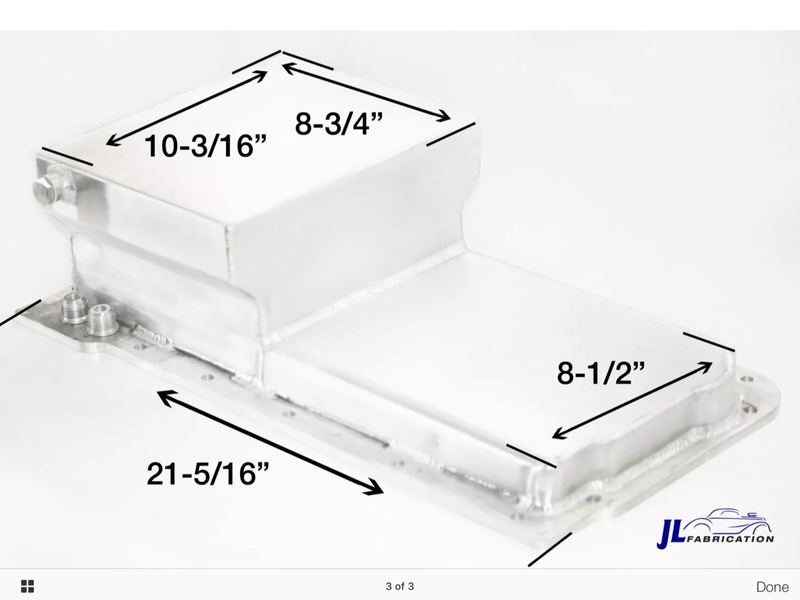 Did you have a look at a dry sump pan to gain clearance? Is the oil pump driven off the crank nose? If so, I'd keep the stock pump, use a single stage scavenge pump and make a tank that fits under the engine. With a tank under the engine you might even get away without a scavenge pump. Now that I have everything clean I can start sketching up a plan. There is a good bit of area clear ahead of the crossmember for a front sump pan, like the one on the engine that came out. In a perfect world the plan is to have the center of the crank at the same level as the stock engine was with the back side of the heads about 1" forward of the firewall at that height. That would shift the most weight to the rear and keep the drivetrain low and linear. Anything beyond that will be a compromise between the goal and cost/time. Spent some time yesterday looking, measuring, and comparing this engine bay with the Vortec in my Jeep. Front to back I have a good 2" to play with using the LQ4 front drive accessories. Options to use Covette or Camaro accessories can give 2" to 1" more if needed. If I keep the crankshaft height centerline the same as before I will have just about 1" hood clearance if I remove the stock Vortec engine cover and install the one like I purchased from Novak for my jeep. The LQ4 front drive assembly is narrow and tall. Without modification to the frame rails I will have about 1/2" clearance between on both sides, except for the power steering tank. Options are to make a small recess pocket in the frame rail, about 1" deep, or use a pump with a remote tank. The crossmember has a slight radius forward and a radius downward in the middle under the engine. These two areas will have to be modified to accept the front sump pan, but not severely enough to warrant trying to fab in another crossmember. Looks like the motor mounts can be fabricated to mount in the stock location. I purchased this front sump pan yesterday, also has AN fittings to relocate the oil filter as it would also be in the way of the steering. Not sure about the transmission tunnel yet, still need to make some more measurements. The stock automatic transmission looks to be marginally smaller than the 4L80. The big conflict is the steering and electronic gas pedal. Besides the mini-fridge sized steering unit, the output location of the steering column is right at the same height as the exhaust ports on the head. There is almost no way to route the exhaust. Also, the Mercedes steering column support/transmission linkage shaft is right in the way of every available electronic gas pedal option. I'm researching now installing a Flaming River steering column and rear steer rack and pinion. Besides giving me some options on placement it also will be a major improvement to the steering in general and a lot less weight. I've done a little searching and have not read that this has been done before. Any comments? As I had in my mind that I would have to spring for a new intake manifold, fuel rails, injectors, and front drive assembly, now that it looks like those can stay and my only big expense might be the steering. The 96+ E class W210 has rack and pinion steering, I think that was the first MB to have RP ( I'm not counting Smart cars or "never made it to the USA". ) See pic of 190 with a W210 rack, pic was from LS1TECH web site. Most ( all ? ) front drive cars are RP so you have a wide range of non MB to choose from as well. Getting the proper end to end length and inner tie rod height and F/R location will take some work to reduce bump steer. For some reason , MB used a remote mount gas pedal pot driven by a cable on 97 and up drive by wire cars rather than a pedal mounted pot. You might be able to fab the new pot to the old linkage using a similar arrangement. 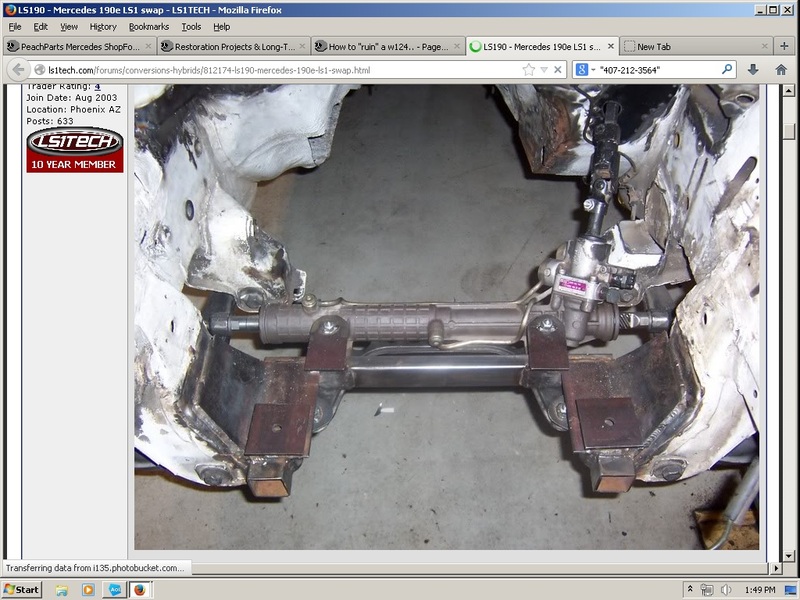 Looking at the picture, from what I can see of your original setup, it looks like the drag link is behind the subframe. Which means getting a RP assembly short enough to mount up right behind the subframe, and one that is a "Standard mount" as opposed to a "Front mount" RP assembly. You'd likely wind up with a setup not unlike what Subarus have, which might mean that would be a rack to consider. 2014 Jeep Grand Cherokee Limited "Hefe", 1992 Jeep Cherokee Laredo "Jeepy", 2006 Charger R/T "Hemi"
Flaming River has a rear steer rack and pinion that looks like it was made for this car. 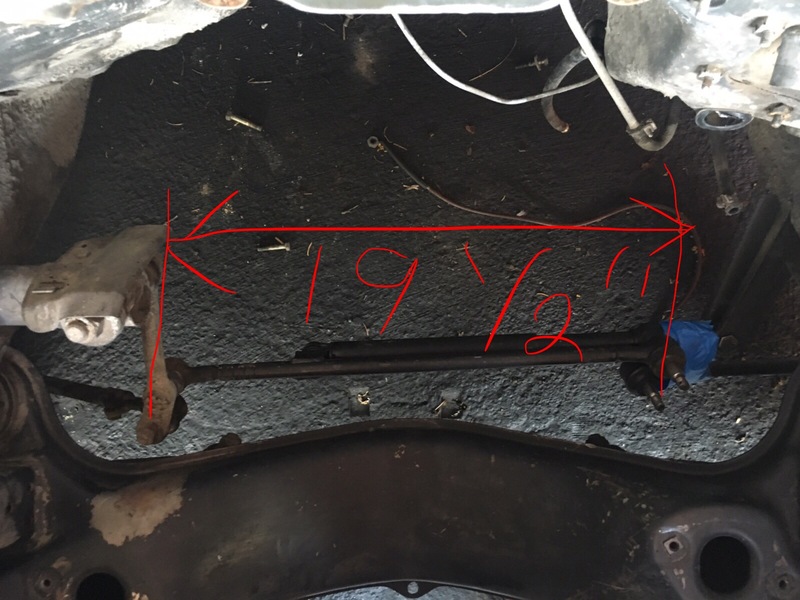 The body of the rack is 19.5", which coincidently is the same dimension as the distance between the ends of the existing tie rod links. The overall length of the rack is 45" the overall distance from tie rod end to tie rod end on my car is 47 1/2". By the time you add the actual tie rod ends to the Faming River rack it should be right there. So with a little work to the crossmember to make a place to bolt the R & P I should be able to exactly match the existing geometry. There are programs to calculate steering and front suspension locations. 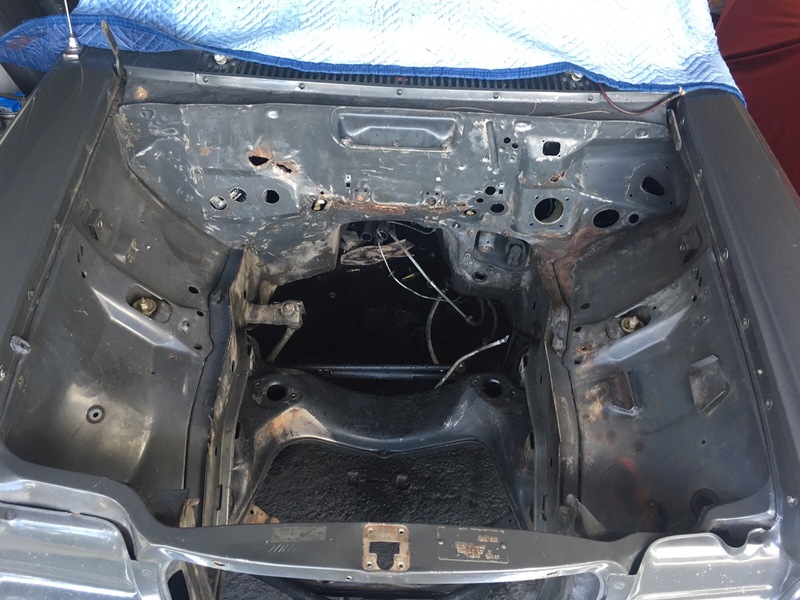 The problem can be getting an accurate measurements of the existing car. Have a look at some oval track racing sites. Rack inner tie rod end center to center is important, matching body length to existing tie rod center won't work. Ackerman is "toe out on turns" ( outside wheel needs a larger turning radius than the inner wheel ) and is only affected by the angle of the steering arms at the spindles, it won't change by changing the rack. Correct me if I am wrong here (I love learning) but if you replace the drag link & tie rods with a RP assembly, aren't you changing the pivot point - therefore potentially changing the Ackerman geometry? Unless the steering angles don't change at all from original, of the tie rods and ends, there's the potential for the geometry to be affected. In SL's statement is contained the basic Ackerman geometry, as a function of the wheelbase, i.e., if the projected steering arms converge at the rear axle, there is said to be "100% Ackerman". Tom's question addresses the amount of toe change with steering angle. In the original MB configuration the drag link experiences a small amount of fore & aft movement as it moves from side to side, and a rack moves only linearly, without the fore & aft displacement. 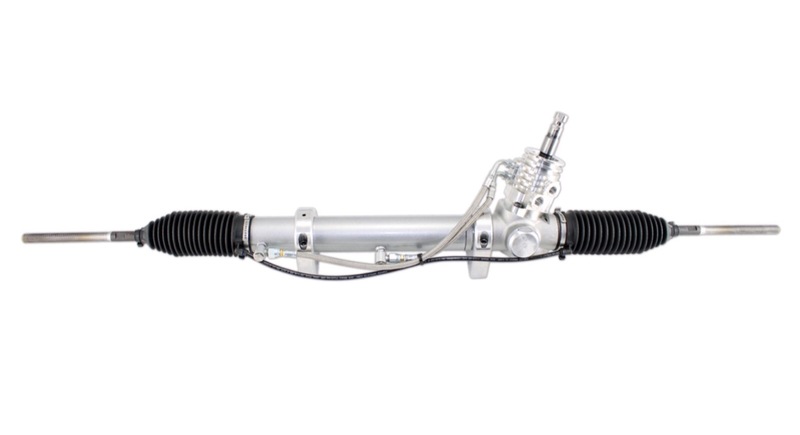 If the length of the tie rods is the same in both configurations, there will be slightly greater toe change with the drag link configuration at large steering angles. Thanks guys for your in depth comments about steering geometry. Maybe I'm missing something. Please explain. The readily available rear steer rack and pinion's body is 19 1/2" long. So it is within ability to mount the R&P in exactly the same location as the ends of the tie rods ends. So what am I missing that I should review and calculate? FYI, the shipping weight on the Flaming River R&P I'd like 23lbs, just the old steering box weighs 35lbs. This doesn't include all the bracketry associated.